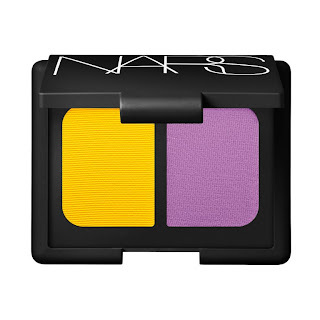 The striking combination of bright yellow and violet that we're getting from NARS in the Fashion Rebel eye shadow duo is apparently rather trendy. The image above was part of a beauty editorial in last month's Elle Netherlands. The theme was Art Deco and it featured bold and very graphic shapes with mostly soft and natural lips.Yellow and purple, alone and together, played a major role in these looks. You can see the other makeup looks here. That combo is not for me - sorry. Yellow - NO! Purple - YES!